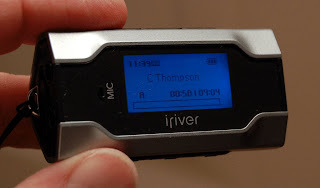 Yesterday I assembled a "20dB attenuator" audio cable to interface between the Aerobat's headphone jack and my iRiver T30 mp3 recorder shown here. Yesterday's flight was primarily a preparation flight for my checkride but I did enjoy experimenting with an audio podcast recording! My cable design worked so well I wish I had made this during my early flight training so as to have an audio record of each lesson. Those early lessons are extremely "busy" times for a beginning pilot. Basically you're operating at the brink of mental-housekeeping overload. 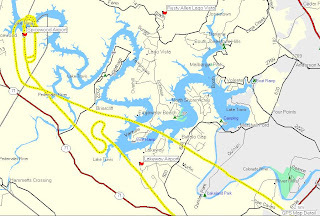 Anyway...click on the link below to hear a snippet of Your's Truly flying back into Austin-Bergstrom Class-C controlled airspace. You can hear my exchanges with ATC (air traffic control) as I make my way towards the approach end of runway 17L. 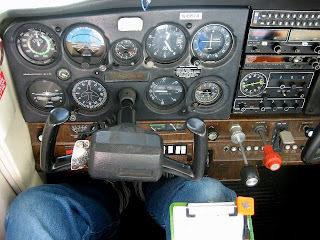 My LightSpeed noise-cancelling headphones (and mic) worked really well to supress the horrendous cockpit noise experienced in the Cessna Aerobat. 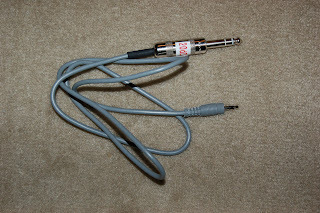 If you are interested in making your own audio cable just leave me a comment and I'll try to follow up. The cable parts cost is about $10 if you are handy with a soldering iron. If you are not sure about which end of a soldering iron you should be holding then you can buy a cable from http://www.barnstormeraudio.com/ Their stuff is reasonably priced and works well.